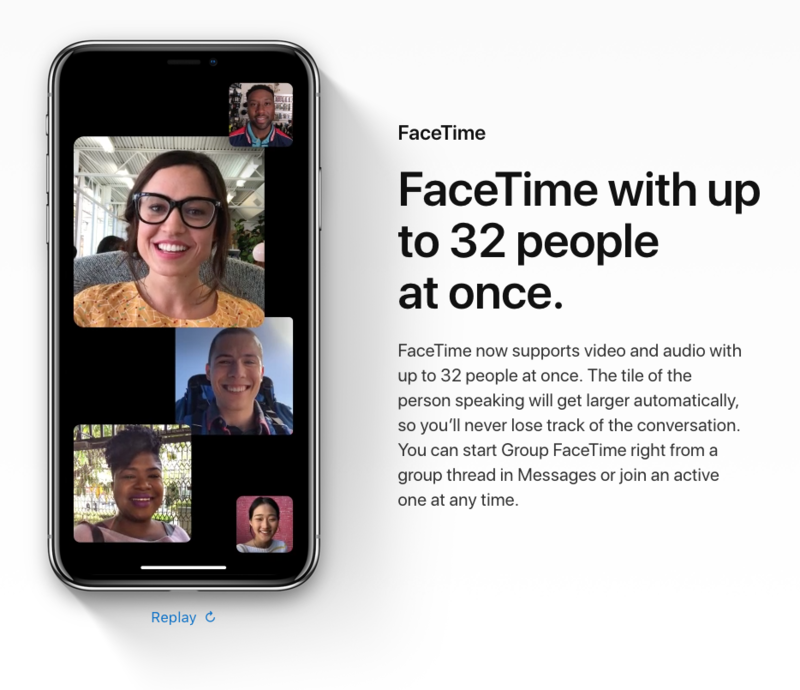 FaceTime with Multiple People – Finally! Apple dropped a bombshell at WWDC this year. A long-desired feature to go beyond a two person conversation to include up to thirty-two individuals. With iOS 12, Apple has changed the game significantly. Seamlessly move from iMessage to Facetime in audio or video with your closest friends and family. FaceTime is a great application for those people that always want to stay in touch with their friends and family via video chat, but the fact that the app is limited only to the iOS platforms is definitely a bad thing unfortunately, since the Android users for example can’t take advantage of the wonderful features that the app has to offer. Thankfully though, there are quite a lot of alternatives for the Android platform that allow a functionality which is really similar to the one provided by FaceTime on iOS. This means that even if you don’t have an Apple device, you can easily take advantage of the technology and perform video chat with your friends without any hassle. Unlike FaceTime, Google Hangouts is available for all the most important platforms, which makes it a viable solution for those that want to video chat with their friends. The interesting thing about Google Hangouts is that it actually enables you to add multiple friends in the conversation without having to pay anything. The video chat solution doesn’t require a lot of bandwidth, which is really nice. In order to use the app you will need to install Google+ for Android, but many Android devices do come with this preinstalled nowadays. Thankfully, Google Hangouts is a very stable application and you won’t experience any crashes so you can talk for hours as long as your phone/tablet has enough battery. Skype is by far one of the most popular applications when it comes to video chat and its Android version works really well. It can record, transmit and receive the videos in real time and everything is full HD, which is really nice indeed. Moreover, you can also use it just to call your friends if you want. In order to add multiple people to the conversation you will have to pay a monthly fee, but for a simple 1 to 1 chat the app is more than enough. Viber is one of the first applications that initiated Wi-Fi calls and since then it has become one of the most widely used Android apps. The great thing about it is that you can also use it for video chatting as well and the video quality is really good indeed. The fact that Viber is also available for desktop basically allows you to talk with your friends that have the app on their computer even when you are on the go. The ease of use and flexibility recommend Viber as being one of the top FaceTime alternatives that you can find for the Android platform. Just like the apps listed above, Facetime makes it very easy for you to keep in touch with your friends in any manner you want, be it via text, audio calls or video chat. The video quality is really good and you will definitely like to talk with your friends in this manner. Another interesting thing about Tango is that the platform also includes quite a lot of games that you can play with friends if you want, which is a really neat addition to say the least. As you can see, there are quite a lot of Android application that can successfully replace FaceTime at any given time. If you want to stay in touch with your friends while you are on the go, then the apps presented above are certainly the best FaceTime alternatives you can find. Even though sometimes you want to stay in touch with your friends via video call on mobile devices, there are situations in which you simply don’t want to use applications like FaceTime for example. Instead, you will want to use web-based applications that provide the same video call functionality, but instead allow you to perform the action inside your browser. There are multiple applications which provide you with such a functionality, and in this list you can find the best ones which are available right now on the market. Despite the fact that it has dedicated applications for many devices, Google Hangouts was actually released as a web-based tool initially, and after that it was expanded to the multitude of devices that we see today. The ability to chat within your browser with multiple friends at once definitely makes Google Hangouts a very useful tool when you want to collaborate with your friends without having to use expensive apps that offer such functionality. The web app is free to access and very easy to use, all you need is just a Google Account and a dedicated plugin that you have to install within your browser. More than a billion people have a Facebook account, so they won’t have a problem using the functionality of this particular app. It’s a very easy to use application that basically requires you to install a plugin and, once you do that, you will just have to start chatting with your friends. The video quality is really good considering the web environment in which the video chat takes place, so it’s a good solution for those that want a web-based FaceTime alternative. This is widely regarded as a videoconferencing service rather than a video chat, but it does work really well and it allows you to record your meetings. Just like the options listed above, it requires the installation of a plugin in order to work properly, but it provides you with a lot of value and you will definitely enjoy its offerings. The interesting thing about AnyMeeting is the fact that you can bring up to 200 different people in the videoconference, so you can use it both for your business or personal matters without a problem. This video chat solution doesn’t require an account, a plugin or anything else, it just connects you and your friends/family with ease. You just use your Facebook or Google credentials that click the button, start the meeting and share the link to the meeting with every friend you want. The chat option is really great, video quality is amazing and this is a service that can be used even by people which are technologically challenged, thanks to its simplicity. This site successfully manages to combine the power of a social network with the features provided by a video broadcasting service. It uses Flash to access your microphone and camera, so you won’t have to install plugins, which is really nice. If you upgrade to the Pro version you can get camera effects, a high quality video as well as filters and numerous other perks. All of the options listed above are a viable replacement tool for FaceTime if you want an easy to use, dedicated web application which provides the same features. The websites in this list offer some amazing services, so you will definitely want to check them all out today. How do I make a FaceTime video call? You can make a FaceTime video call in multiple ways from your iOS device. Phone: While on a phone call, you can tap the FaceTime icon to invite the other party to a FaceTime video call. FaceTime: Place a FaceTime video call using your contacts list by tapping the video icon. Contacts: Tap the FaceTime video icon to place a FaceTime video call to the contact you are viewing. How do I make a FaceTime audio call? You can make a FaceTime audio call in multiple ways from your iOS device. FaceTime: Place a FaceTime audio call using your contacts list by tapping the phone icon. Contacts: Tap the FaceTime phone icon to place a FaceTime audio call to the contact you are viewing. It’s a simple as that. Hope this is helpful! From the great teachers at Lynda.com comes this comprehensive tutorial on how to get the most out of Facetime on your iPhone. This video is a bit old, in that it uses iOS 6 instead of the current iOS, but concepts are still the same and even most of the settings work just like they used to. If you want an in-depth look at the main features of FaceTime, this is a great place to start. Starting in iOS 7 you could already make audio-only Facetime calls person-to-person. But with the upcoming point release of Max OS X Mavericks, you’ll be able to place audio calls from your Mac as well. Check out 9 to 5 Mac for the details. You may recall that Facetime uses extremely high-quality audio for voice calls–much better than you can get over traditional phone lines. This will be big.